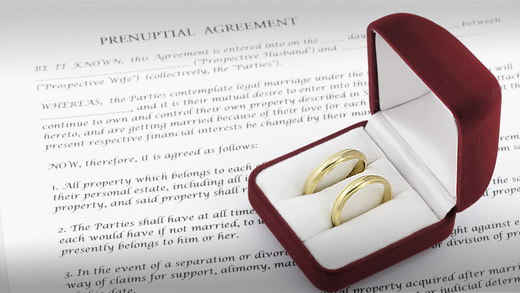 Bohm Wildish & Matsen are your full-service prenuptial agreement experts. Whether you are looking to create a prenuptial agreement, to have one of our expert attorneys interpret one that has been presented to you, or to have an existing prenuptial agreement enforced, Bohm Wildish & Matsen is here to help you. Many clients who are contemplating marriage need to work with an attorney to draft a prenuptial agreement that will protect their current and future assets. Bohm Wildish & Matsen will work with you to ensure that all that you have acquired or will acquire will be protected in the event of your marriage ending. Keep what is rightfully yours! If you need assistance creating a prenuptial agreement, the attorneys of Bohm Wildish & Matsen will help you protect what is yours. If you are presented with a prenuptial agreement by your future spouse, you must consult with an attorney other than the one who drafted the document. Bohm Wildish & Matsen will provide you with expert representation, review the terms of the document, and counsel you on the effects of signing the agreement. If you need a prenuptial agreement interpreted, Bohm Wildish & Matsen has the resources and expertise to protect your interests prior to marriage. If your marriage ends, but you signed a prenuptial agreement, Bohm Wildish & Matsen can work with you to make sure that the terms of your agreement are enforced. Our firm has the experience to know how to fight for you, your rights and your property. If you are getting divorced and have a prenuptial agreement, Bohm Wildish & Matsen will make sure that the terms of your agreement are upheld and your assets are protected. Learn more about pre-marital agreements. Couples can agree to affect their marital rights incident to their marriage, both during their lifetime and even after their death. The primary difference between prenuptial agreements and marital agreements concerns the fiduciary or confidential relationship the spouses have to one another, created by the marriage (Family Code §§ 721(b), 1100(c)). Once married, both spouses become a fiduciary to the other. As such, imposed on each spouse is the duty of highest good faith and fair dealing with the other spouse, and neither spouse can take any unfair advantage of the other. Included in this fiduciary relationship is the requirement that both spouses provide the other with full disclosure of any and all information pertaining to issues contained in the agreement. Marital agreements, if challenged at a later date, impose on the spouse defending the agreement a greater burden of proof that the agreement is not unfair to the other spouse. By contrast, there is no fiduciary relationship presumed between prospective spouses, and accordingly, there is no presumption of undue influence created by a fiduciary relationship if a prenuptial agreement is later challenged. If the spouses are making an agreement that includes rights after death, (usually waiver of rights set forth in the California Probate Code) they must make sure the agreement complies with the applicable sections of the Code. Further, if spouses are making agreements affecting their respective rights to pension benefits, they must comply with the United States Code (federal law). These can be complicated issues and it is always best to have an attorney familiar with the law draft the agreement. One example of a marital agreement is a transmutation agreement, where spouses agree to change the character of a property from community to separate or separate to community. For instance, if the husband owned a house before marriage, (his separate property) and after the marriage, he wants to make the house a community asset, (he and his wife own the house jointly), an agreement to effect the change from separate property to community property is called a transmutation agreement. The law regarding transmutation agreements is very specific, and unless all the conditions are met, the agreement can be set aside at a later time. Another type of marital agreement is an immediate separation agreement, where a separating couple may enter into a written agreement providing for an immediate separation and support (child and/or spousal) pending a divorce. If you need assistance in drafting and interpreting post-marital agreements, Bohm Wildish & Matsen is here for you. Contact our office today to schedule an initial consultation so we can answer any questions you have regarding post-marital agreements.